You may turn to alcohol for a number of reasons; scared of failure, scared of succeeding, not knowing how to deal with things that have happened in the past or currently going on in your life, or maybe you just got caught up in the lifestyle. What ever the reason is, know that you are not a lone and that you can go on to live the life you want substance free. Most alcohol rehabs (92%) are 12-step, disease model based meaning that they teach you that you have a disease called alcoholism that you are powerless and can't control your drinking. They also teach you that you are insane and only a "higher power" can "restore you to sanity". A common cliche that is also used in these alcohol recovery programs is "relapse is part of recovery". These ideas are not true and they have actually been proven, through research, to decrease your chance of getting sober and staying sober. The success rates of these new york alcohol recovery programs are very low 5-20% (their numbers, not ours). 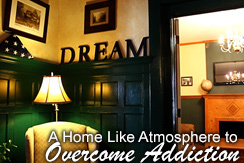 Here at the Freedom Model Retreat House offer an alternative to traditional residential alcohol rehab programs. We have been teaching the truth about alcohol use for over 17 years, and the research has documented effective ways of helping people for over 20. By empowering you to take control of your life, we have the highest independently verified success rate in the country - 63%. The truth is you are not diseased, powerless or insane and relapse is definitely not part of recovery. Alcohol abuse is a choice, not diseases. Being that this is a chosen lifestyle is not necessarily a negative thing, as that means you can move on with your life and you're not be doomed to a life of meetings and relapse. The Freedom Model Retreats alternative to alcohol rehabilitation program will empower you and give you the tools on how to live the life you have always envisioned for yourself. Here, at the Freedom Model Retreats we teach the Freedom Model. We are giving you the tools on how to think for yourself rather then telling you what to think like other traditional New York alcohol recovery programs.